With the launch of the new iPhone 6s and 6s plus, Apple once again impresses with new features that set them a step ahead. 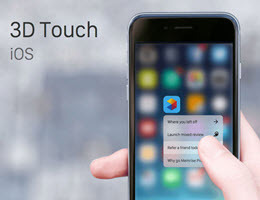 The 3D Touch feature is a world’s first and provides various useful tools to assist users in everyday tasks. The 3D Touch feature worlds with most applications on the device and offers a range of quick view options. It’s unconfirmed, but obviously an answer to Samsungs touch ten released with later Note devices a few years ago. Apple has taken the extra step and created and entire new display that measures the amount of force placed on the screen. This allowing the developer to set various options depending on the pressure. For example; before a soft or hard tap on the camera app would only open the camera and allow users to take pictures, but now you can tap softly to open the quick menu where options such as take selfie, record video, record slo-mo or take a picture are presented. Thus giving users the ability to access the feature they desire within the app instantly. The 3D Touch also allows a peek function. This will allow a hover screen to be open when pressing on pictures, emails, websites, Facebook pages and much more. Once again the amount of pressure applied is crucial as users can get a quick view into emails to see content without opening the email. This feature has proven very beneficial while searching for certain files or emails on the device. We are expecting many more features to become available with 3D Touch, which will only make it more useful and enjoyable with future smartphones. Apple has managed to impress with all of their devices launched over the years. The world-renowned mega company has been a leader in both mobile and computer devices and have managed to stay ahead with some unique features. Android might be bigger, but is supported by multiple mobile companies such as Samsung, LG, Blackberry, Sony and more, whereas Apple has always been independent and offered used amazing features that can only be utilized by those with Apple devices.